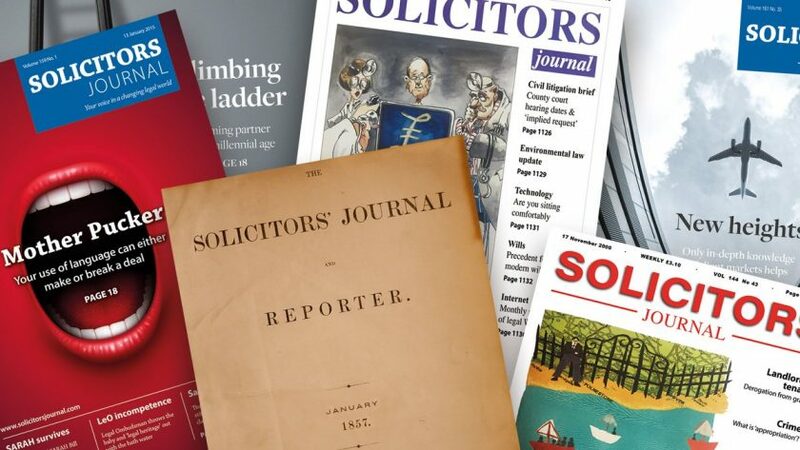 When ICLR was founded in 1865, the Solicitors Journal was already almost a decade old. For many years, the two publishers have been associated, principally through the legal case summaries which ICLR’s reporters have contributed to the magazine. Earlier this month, the journal’s current owners made the no doubt agonising decision to close it down. Paul Magrath of ICLR offers a personal and professional farewell. No doubt Shaen would be fascinated to read this final edition on an electrically illuminated screen rather than the paper on which, until recently, it was printed. No doubt a few other technological changes of the last 160 years would fill him either with wonder or with consternation. He might chuckle to see the Royal Courts of Justice in the Strand still busy with litigation, after having reported in 1865 of the challenges the proposed new building (eventually opened in 1882) would face and the need to ensure easy access for lawyers despite the “immense amount of traffic” in the Strand. Whilst covering a range of subjects affecting solicitors, from practical issues involving the legal professions to more general issues about the law, the journal has also long provided updates on recent changes in the law, both in respect of new legislation and in relation to new case law. The final edition is no exception, with its “Lawbrief” page in the back of the magazine devoted to recent cases decided by the Master of the Rolls (appropriately enough, given his historic responsibility for the solicitors’ profession) and the Supreme Court (which did not exist in 1857, and meant something quite different from 1873 to 2009* ). The case in the Court of Appeal presided over by Sir Terence Etherton MR, appropriately enough, concerns solicitors’ negligence. Judgment was given during the legal vacation, on 25 August. You can read the case summary on ICLR’s own website: Schubert Murphy v Law Society of England and Wales  EWCA Civ 1295;  WLR (D) 583. In earlier times, before judgments were rapidly disseminated via BAILII and the big professional subscription databases, a case summary in a newspaper or legal journal was often the best early access the legal professions had to new case law. ICLR has reporters covering all the senior courts, and in the days before everything was computerised they would sit in court, privileged as law reporters to sit in counsel’s row, and take hand written notes during the hearing and, especially, while judges gave oral judgment. Even when it became common practice to issue reserved judgments in typewritten form, the presence of a law reporter in court ensured there would be an early warning system to alert the legal professions across the land that, say, a High Court judge in the Chancery Division had laid down a new principle or clarified an old one, thereby setting a precedent. After a brief report might have appeared in the Times, the case would be written up for the Solicitors’ Journal and the Law Society Gazette. ICLR’s reporters would supply the copy, based on an early draft of the headnote they would eventually use in the Weekly Law Reports, and an editor would sub it before sending it off to the journal. The payment we received, though modest, was a nice little supplement to our fees from ICLR. If the point of law was a minor or specialised one, or was overtaken by a speedy appeal, the report in the journal might be the only one available. It would be signed by the reporter, a barrister or solicitor, able to vouch for its accuracy, and ensuring thereby that it could be cited in court. And it frequently was, with the citation reference “Sol J” or more recently just “SJ”. For example, a quick search on ICLR.3 has shown me that in the recent case of JSC BTA Bank v Ablyazov (No 14)  EWHC 230 (Comm);  QB 853 there are several references to Fairclough and Sons v The Manchester Ship Canal Co (1897) 41 SJ 225. And in In re W (An Infant) (Adoption)  2 QB 589 (CA) there is reference to In re L (An Infant) (1962) 106 Sol J 611, CA. So much for ICLR’s relationship with the journal. But I want to add a personal note, partly to record my pleasure in knowing the editor, Jean-Yves, and my honour in being invited, by him and his deputy editor, John, to take part in the Chambers of the Year category of the Solicitors Journal Awards 2017. I very much enjoyed not only the process of reviewing the shortlisted chambers’ entries and checking out their websites, and participating in a collaborating online judging process, but also the chance to meet my fellow (and far more distinguished) judges, including in particular Sir Henry Brooke, at the splendid dinner put on for the awards at Grand Connaught Rooms in London. It was a lively occasion and heartening to see so many enjoying themselves in support of the legal profession. There was also a generous response to a speech, on behalf of his Billable Hour appeal for Save the Children, by Sean Jones QC. Though there have been many worthy winners of awards in this and previous years, It is a great shame there will, presumably, be no Solicitors Journal Awards 2018. A victim, like the journal itself, of the changing dynamics of the legal publishing marketplace. We don’t know what we’ve got till it’s gone. Serious commentary and reporting is worth supporting, more so now in these days of fake news and dodgy statistics, than ever before. 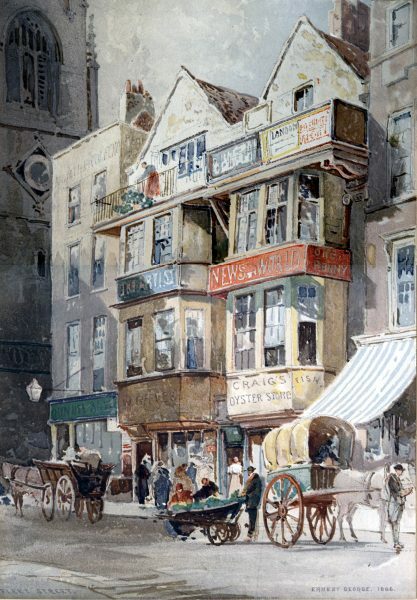 Featured images: (1) Print of a watercolour of Fleet Street, London made in 1886 by Ernest George (1839-1922), scanned from a print made by G.Rowney, Sept 1887 (via Wikimedia Commons). (2) Image from Solicitors Journal Twitter account.